Exotic Aquarium is closed after 60 Years in Business due to the current Economy in Detroit, . We would like to thank our many customers over the years for shopping at Exotic Aquarium. ExoticAquarium.com website will eventually become a informational website about Tropical Fish care, informatoin and maintanence. Kevs Aquarium is located at 16895 Schaefer on the same side as the old Exotic Aquarium, 5 doors down towards Mcnichols. They carry both Freshwater and Saltwater Tropical Fish Store in addition to Aquariums and related supplies for your Tropical Fish needs. The new store opened in February 2012, Kevs Aquarium is keeping the Tropical Fish hobby alive being one of the few remaining Pet Shops located in the City of Detroit, possibly the only "fish only store" that still exists in the city proper. could break and damage the Aquarium and cause glass breakage. or Click Here for More Detailed Information about the recall. 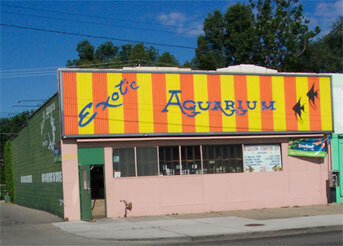 Exotic Aquarium was a retail Pet Shop located in Detroit, Michigan. We know of at least two other pet shops in the United States that have similar names but are NOT AFFILIATED with this Store. As a convienience to our Internet Users we are providing links to their sites. Please Visit our Links page for direct links to other stores in the United States called Exotic Aquarium. If you are looking for a good Pet Shop in Detroit - click here!